Welcome to October...the last three months of the year are definitely my favorite. Cooler weather finally arrives here in Texas, football season is full swing...and there's all kinds of fun holidays to celebrate! First up is National Taco Day on October 4th. Tacos are one of my most favorite foods...what's not to like? They're so versatile...and they definitely feature the Big Flavors that we crave at my house! This week, #SundaySupper is celebrating National Taco Day by sharing our favorite taco recipes just in time for your celebration this coming Wednesday. I'm sharing a taco today that's perfect for those times when you just can't decide if you're hungry for shrimp or beef. 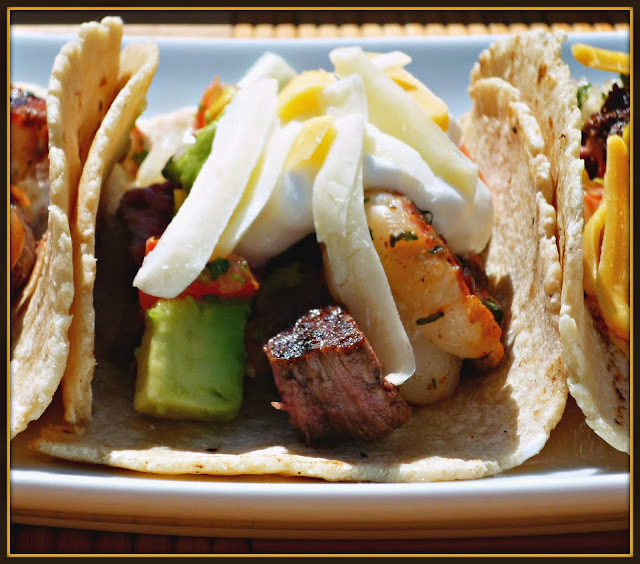 My Surf and Turf Tacos solves that problem perfectly -- it features both! Add in a colorful avocado-corn salsa, a bit of sour cream, and some shredded cheese -- and you've got yourself one fabulous meal. 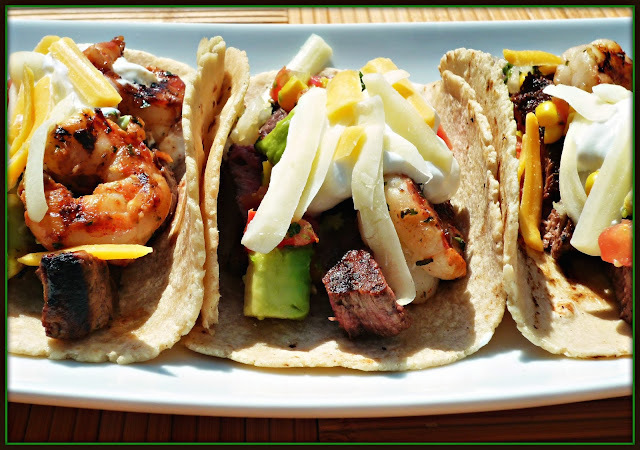 To save time, the shrimp and beef can be added to the simple marinade the night before and refrigerated -- which means these tacos can be on the table in about 30 minutes for dinner the next day! Step 1: Make the marinade. 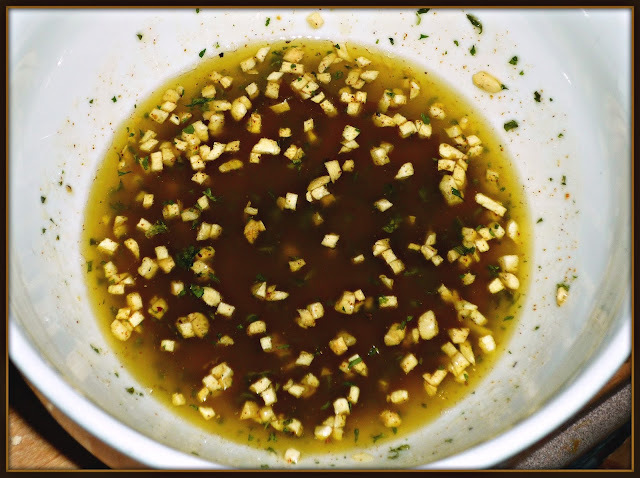 Add the olive oil, agave, lime juice, garlic, chile powder, cilantro, and salt & pepper to a small bowl. Whisk until combined. Place the shrimp and beef into two separate plastic zip-top bags. Pour half of the marinade into each bag and seal. Give the bags a shake to ensure the flavorful marinade reaches all of the contents. Refrigerate at least one hour -- up to 24 hours. Step 2: Make the salsa. Add the pico de gallo, corn, and avocado to a bowl. Toss to combine the ingredients, being careful not to break up the avocado too much -- we're not making guacamole here. Cover and refrigerate until you're ready to assemble the tacos. NOTE: If making the salsa more than an hour or two ahead of serving, don't add the avocado until just before. Step 3: Preheat your grill. Remove the beef from the marinade and cook to your desired level of doneness. We like steak cooked medium, which took 3-4 minutes per side. 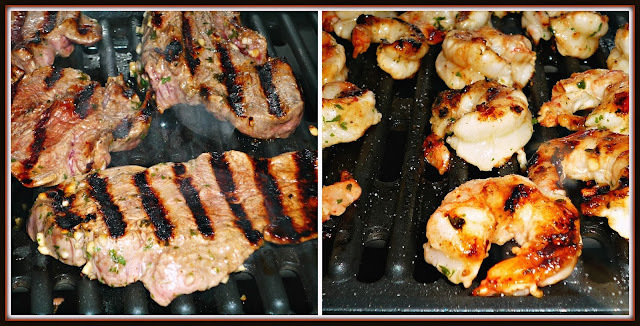 While the steak rests, grill the shrimp for 2 minutes per side -- until they are cooked through. Slice the steak into slices (no more than 1/2-inch thick). Step 4: Assemble the tacos. Grill the tortillas on both sides to warm them. Add a bit of the sliced steak and 2-3 grilled shrimp. 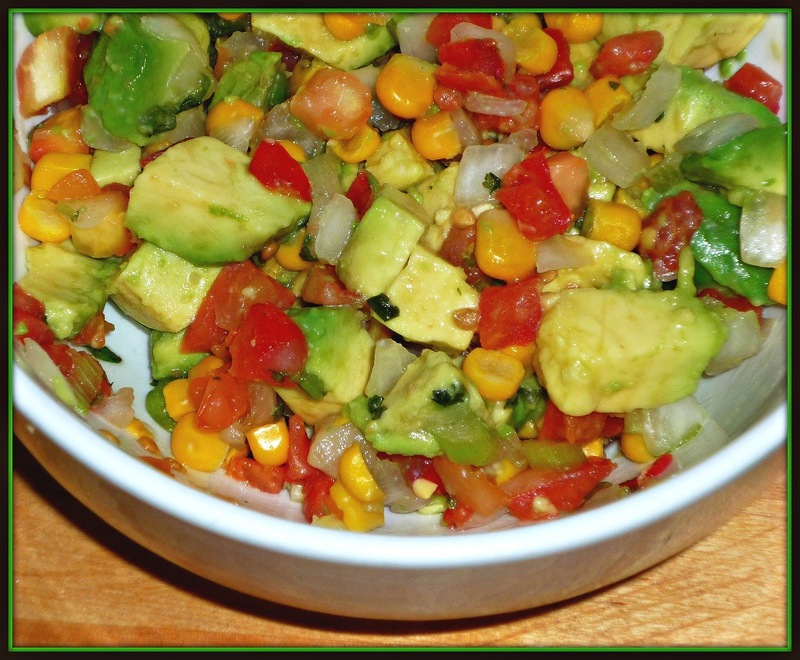 Top with sour cream, cheese, and the avocado-corn pico. That's it! These tacos are so delicious! Tender beef and sweet shrimp combine with the lightly spicy avocado-corn salsa, cooling sour cream, and shredded cheddar. They're a flavor explosion in your mouth. 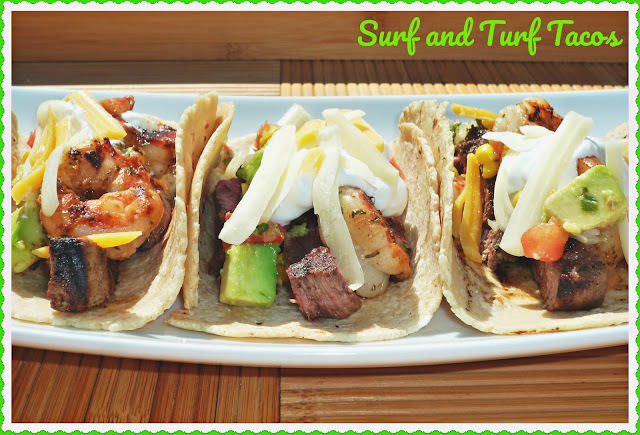 These Surf and Turf Tacos are definitely a complete meal on their own, but we love to enjoy them with chips and salsa on the side. Sometimes I even stop by our favorite Mexican restaurant to pick up borracho beans and Mexican rice "to go" and serve them on the side. Do you love tacos? If so, be sure to check out all of the great taco recipes this week's #SundaySupper participants are sharing via clicking the links below. Whatever type of taco you're craving, we've go you covered! Be sure to join the #SundaySupper conversation on Twitter all day today! We tweet throughout the day, and we share recipes from all over the world! Our weekly chat starts tonight at 7:00 pm ET / 6:00 pm Central. Follow the #SundaySupper hashtag, and remember to include it in your tweets to join in the chat. To get more great Sunday Supper Recipes, visit our website or check out our Pinterest board. Would you like to join the Sunday Supper Movement? It’s easy! You can sign up by clicking here: Sunday Supper Movement.